offering, we have a solution for you. Are you looking for local IT solutions tailored to suit you and your business? Look no further, we’re here to help. 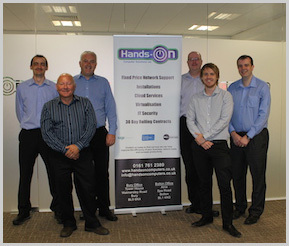 Hands On specialise in providing the best business IT support Manchester has to offer. We’ve supplied specialist, fully-extensive computer solutions to Greater Manchester businesses for more than 24 years. We know that time is money and every business is different; that’s why our IT solution services are flexible and won’t break the bank. Our technicians provide IT solutions for small and medium businesses, combining flexibility with a friendly face. Working like an in-house team, we provide local IT support but without the expensive price tags. For the very best in IT and network support, Manchester companies of all sizes and in many different sectors have made us their first and only choice. By coming to us for business IT support and solutions including our cloud and sage systems, Manchester based businesses can take advantage of our complete solution safe in the knowledge that a dedicated member of our team is always just a quick call or email away. Our experience speaks for itself, but if you’d like more information, we’re always on hand to chat. Call us today on 0161 761 2389 to see which of our professional IT support options can benefit your business. Our IT support packages are designed for businesses with between 2-250 users. Find out how we can help your business today. As a fully accredited Sage Business partner, we offer Sage solutions for Sage 50 Accounts, Sage 50 Payroll & Act! Looking to update your Email systems to the latest technology? Take a look at our Hosted Exchange solutions. 60% of companies who are hit by a disaster file for bankruptcy within 6 months. Find out how you can protect your business today. Excellent support and advice. The service and maintenance of our IT equipment is first class. Copyright © 2018. Hands-On Computer Solutions Ltd. All rights reserved.